South Ossetia (purple) and Abkhazia (green) within the claimed borders of Georgia. Click to enlarge. Map by ChrisO based on UN map of Georgia (public domain; source). At PolGeoNow we promise to inform our readers any time one of the world's countries changes its name, even if it's just a modification to the country's official long name, or a switch in the name's preferred English translation. But there was one name change we missed out on reporting last year - depending on what you consider a "country". 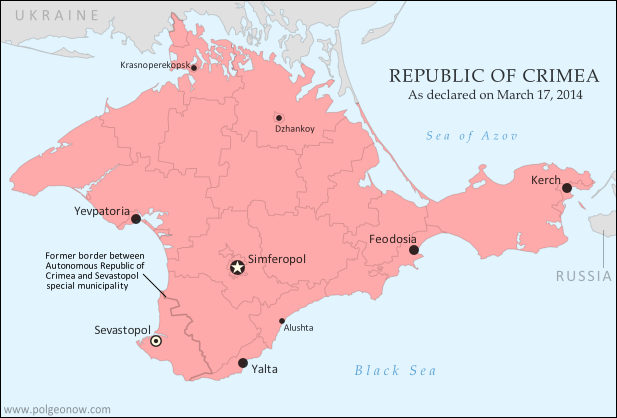 In April 2017, people in the disputed Republic of South Ossetia voted to change the self-declared country's full name to "The Republic of South Ossetia – the State of Alania". 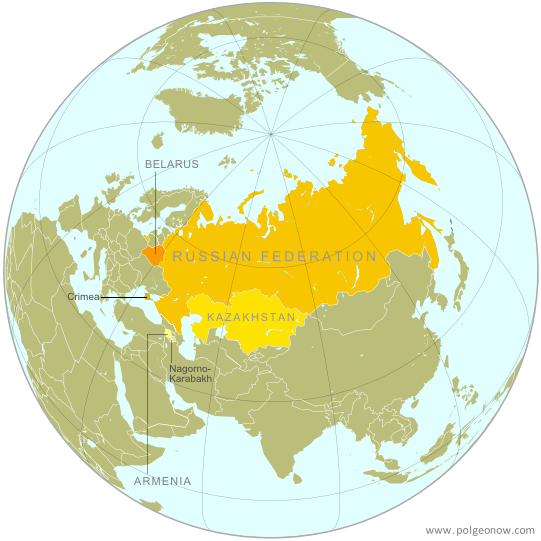 The name change referendum reportedly passed with about 80% of valid votes in favor, though many countries strongly condemned the whole process, seeing it as part of an ongoing Russia-led attempt to steal the region away from Georgia (the country, not the US state). Map: Which Countries Recognized Abkhazia and South Ossetia in 2018? 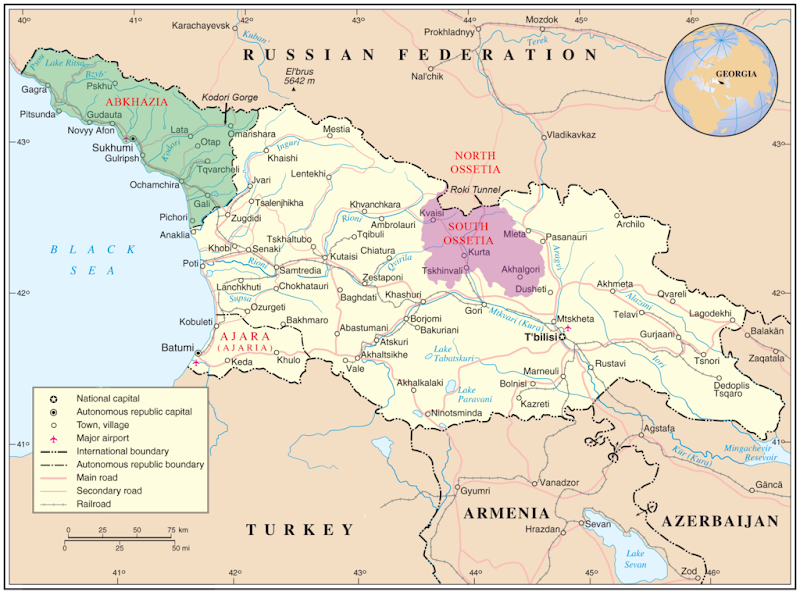 This is our new, completely redesigned map of which countries consider disputed South Ossetia and Abkhazia to be independent from Georgia. 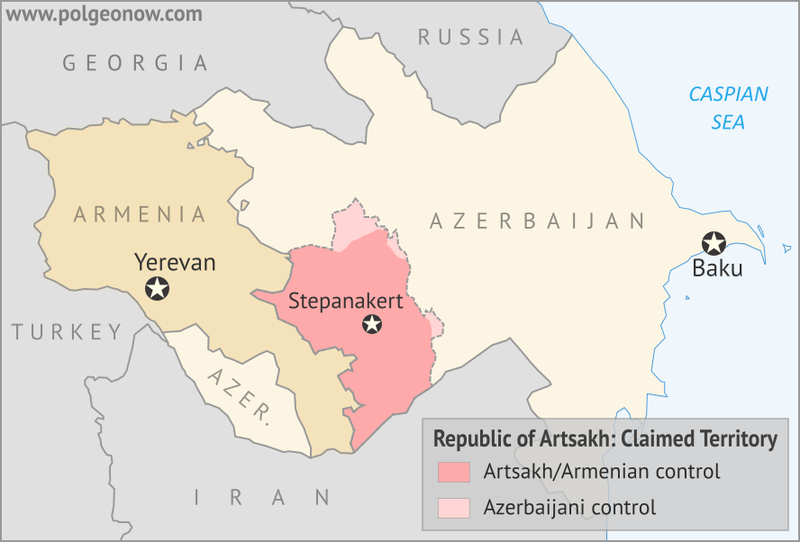 From now on, PolGeoNow will report on any changes to Abkhazian or South Ossetian recognition with updates to this map. Map: Which Countries "Recognize" Taiwan? This map and explainer will be updated whenever there's a change to the list of Taiwan's "diplomatic allies". You can find articles on each change by scrolling to the bottom of this page, or by viewing all Taiwan articles on PolGeoNow. At PolGeoNow we frequently report on self-proclaimed, unrecognized or partially-recognized countries - but Taiwan is a special case. 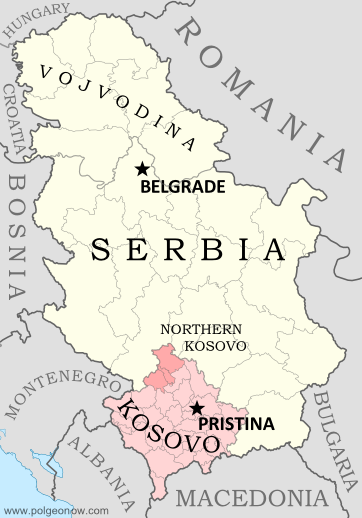 It operates like an independent country today, but has never formally declared independence. Instead, Taiwan and its surrounding islands govern themselves as the "Republic of China" (ROC), under a constitution brought there by a former government of the Chinese mainland. This map report is part of our Referendum 2017 coverage, spotlighting controversial independence votes in two of the world's autonomous regions: Kurdistan voted for independence from Iraq last month, and Catalonia tried to vote on leaving Spain on Oct. 1. Now we've mapped out Catalonia's results in detail based on data from the regional government. On October 1, Spain's autonomous region of Catalonia tried to hold a referendum on independence from Spain. After Spanish courts ruled the vote illegal, Spanish national police attempted to prevent voting, and the result was that voting was disrupted in many areas and not organized properly in most others. 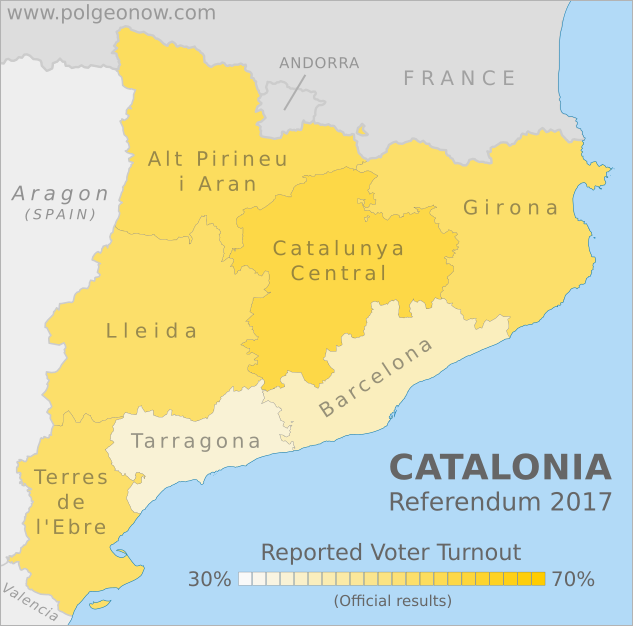 Still, Catalan government data states that some 42% of the region's residents came out to vote anyway, and of those who did, about 90% voted in favor of secession. Though Catalonia's president had promised to declare independence within 48 hours of a YES victory, so far he's delayed doing so. Updated! Catalonia Referendum Results Maps: How Did Each Region Vote? Updated! 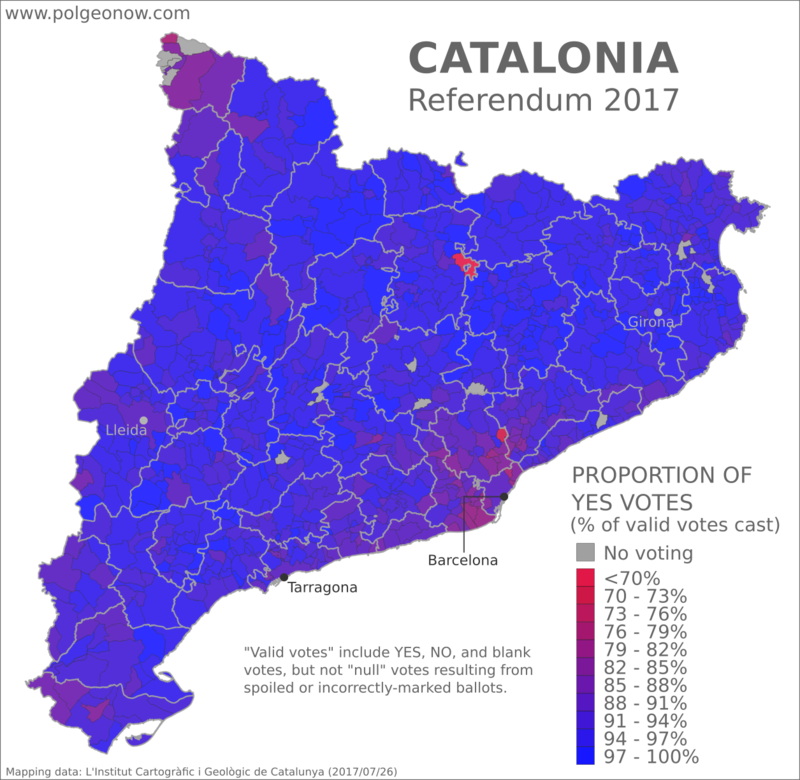 This article's maps and text have been updated with final results released by the Catalan government. See below for more details. We also now have an article with detailed results maps broken down by municipality. This map report is part of our Referendum 2017 coverage, spotlighting controversial independence votes in two of the world's autonomous regions: Kurdistan voted for independence from Iraq last week, and Catalonia voted to leave Spain this weekend. Now detailed results are available, and we're working on getting them mapped out. Detailed, final results are now available for Catalonia's controversial referendum on independence from Spain. The vote was widely disrupted by the Spanish police after courts ruled it illegal, resulting in massive irregularities that will make it hard for outsiders to accept as a proper democratic referendum. Still, some 43% of eligible Catalan voters reportedly made it out to cast ballots, meaning there's plenty of reported data to look at. Catalonia Voting on Independence: What Will Happen? This article is part of our Referendum 2017 coverage, spotlighting controversial independence votes in two of the world's autonomous regions: Kurdistan voted for independence from Iraq this Monday, and Catalonia is about to vote on leaving Spain. Update: Check out the bottom of the article for a brief summary of what's actually happened since referendum day! 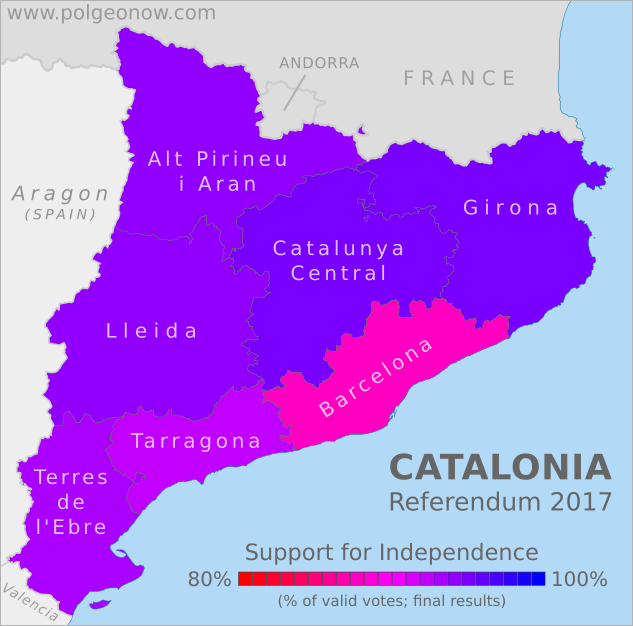 Referendum 2017: What is Catalonia? 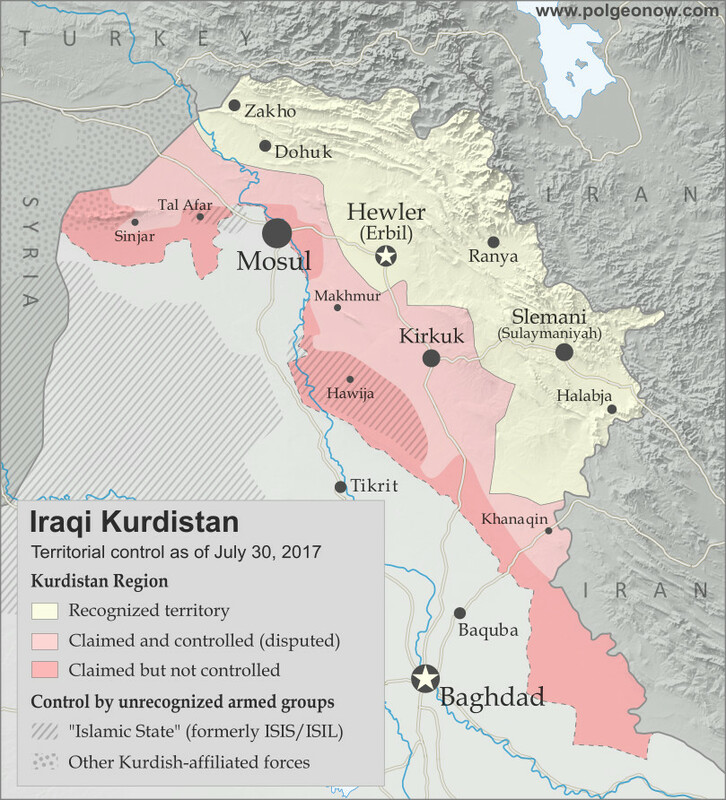 This article is part of our Referendum 2017 coverage, spotlighting controversial independence votes in two of the world's autonomous regions: Kurdistan voted for independence from Iraq this Monday, and Catalonia will vote Sunday on leaving Spain. The following article is adapted from one originally published in 2013. Not Independent Yet: So What is Catalonia Now? 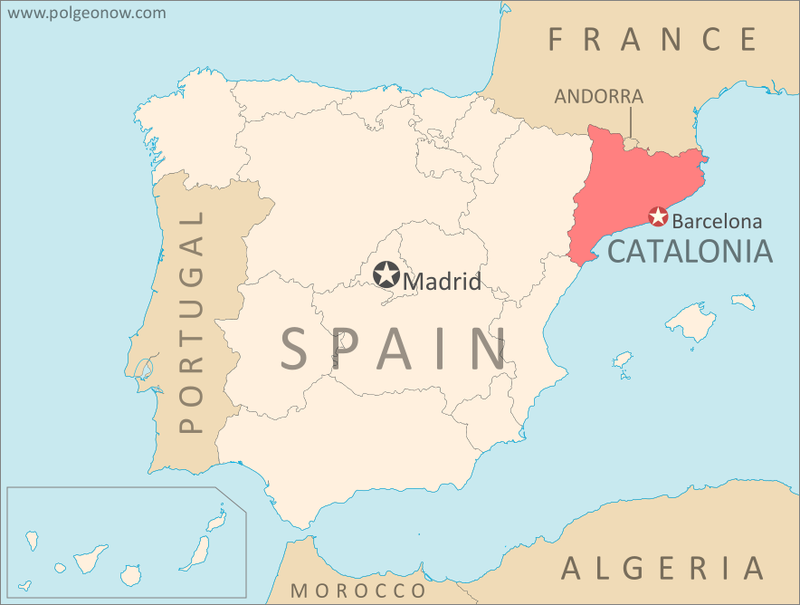 Catalonia is one of the "autonomous communities" of Spain (kind of like a state in the US), and also holds the official status of a "nationality" (but not "nation") within the Spanish system of government. Regions of Spain with this status are considered to be something similar to countries within the larger Spanish nation, allowing for their own separateness from Spanish mainstream culture without actually being independent. There are newer versions of this map available. You can always find the latest version, and a list of all related articles, on our Which Countries Recognize Taiwan? page.